Daniel Wellington watches are a favourite of mine when it comes to adorning my wrists. You may have seen this red and navy striped number stealing the show in a recent outfit post of mine here. Their designs are simple, classic and elegantly chic meaning they are the perfect accompaniment to any everyday outfit. I always find myself reaching for one of my DW watches in the mornings as tend to fit in with anything I'm wearing. Featured here is the Canterbury Classic design with a rose gold watch face, just because rose gold is simply the best. I'm really not over the 'rose gold' fad that appeared several years ago. As someone who is a little unsure on gold, I find rose gold a little softer and less brazen. Granted the striped strap does take a little more thought with styling over my Classic Sheffield watch, but it sits as a humble statement piece on my wrist that draws a little more attention. James opted for a piece from the brand new menswear 'Dapper' collection, which feature striking blue set of hands on the face. In fact, I'm really quite jealous of his 'Dapper' watch and find myself wanting to pinch it for myself from time to time! 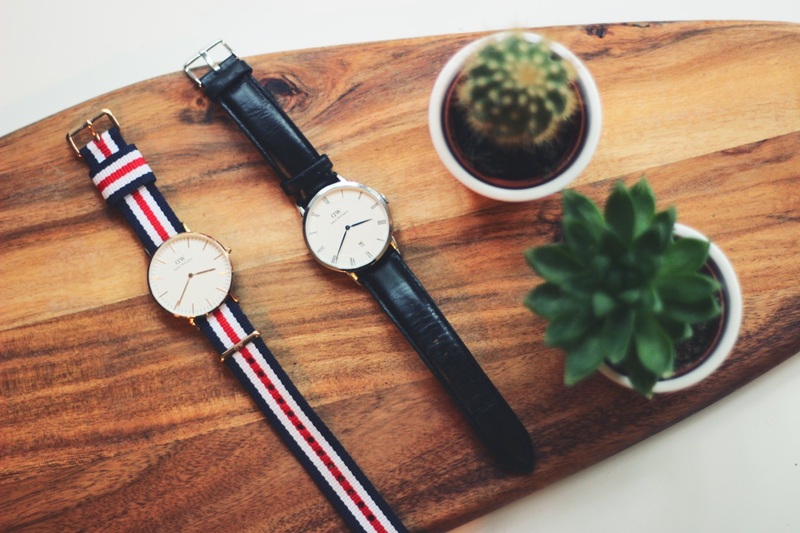 Daniel Wellington are offering Fox & Feather readers a generous 15% off their order until the 31st October 2015. All you have to do is pop the discount code 'foxandfeatherblog' in at the checkout. Happy shopping!